EGPROC will travel to new shores and be in Aarhus (Danmark) for the first time in 2018! Jacob L. Orquin will organise next year’s conference – thanks Jacob! 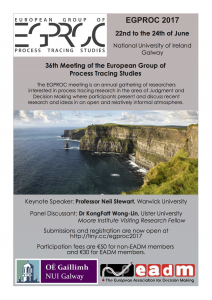 Between the 22nd and 24th of June, 2017 the EGPROC meeting will take place in Galway, Ireland. So, see you 2017 in Galway, Ireland! Find the preliminary Program of our 2016 meeting here! The EGPROC meeting 2016 will be held at the MPI for Research on Collective Goods in Bonn, between June 23-25, 2016. Here is the conference page and the submission page. after a great conference in Salzburg the 34th EGPROC meeting will continue in Berlin at the Max Planck Institute for Human Development, between April 16, 2015 – April 18, 2015.
we would like to remind you that EGPROC 2013 takes place in Warsaw on 19-21 April 2013 at Kozminski University. Details and program will follow. EGPROC will be held in Bolton, UK between May 3-5, 2012. Here is a link to the conference website. Rob Ranyard and Olga Kostopoulou will be the main organizer.